The strength of ionic bond increases with the increase of lattice energy. And lattice energy depends on two factors: size or radius of ions and charge of ions. As the radius of ions increases, the lattice energy decrease. Below is a graph of the lattice energy of lithium halide. 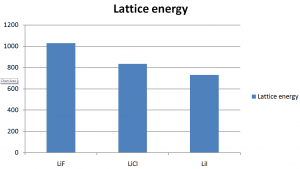 As the size of halide increases down the group, the lattice energy decreases. This is because with the increase of size of ions, the distance between their nuclei increases. Thus the attraction between them decreases and finally the less lattice energy released during the process. Lattice energy increases with increase of charge on the ions because of their more attractive force between them. Thus +2 or -2 ions will release more lattice energy than the +1 or -1 ions. 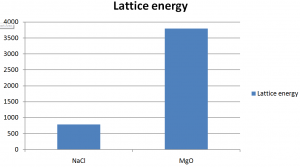 Here we can see that the lattice energy of MgO is much greater than the lattice energy of NaCl. The calculation of lattice energy can be done by using Hess’s law (for this case it is called Born Haber cycle). According to this law the energy change is same for a particular reaction regardless whether the reaction undergoes in one or several steps. So the total energy involved to form a ionic compound from its elements will be same whether it happened in few steps or in one step. For an example, the solid sodium and chlorine gas reacts to form sodium chloride crysltal. The energy change will be same whether it reacts in few steps or in one step. Below is the Born haber cycle for the formation of sodium chloride crystal. First step involved the formation of sodium atom in gaseous state from its standard solid sodium. This is known as atomisation and the energy change during this process is knows as atomisation energy. The energy change involved to get 1 mole of gaseous atom from its standard state is known as atomisation energy. The atomisation energy for this step is +107 kJ/mol. 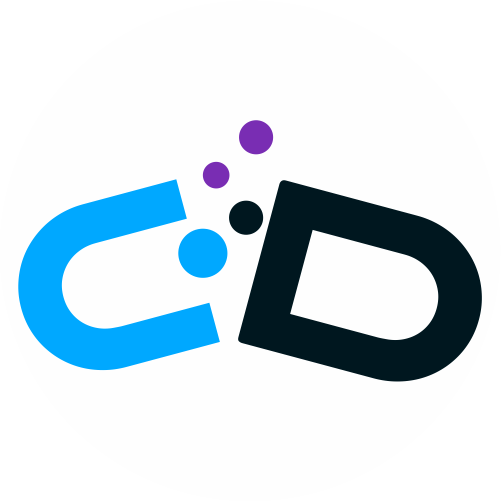 Second step involved the dissociation of chlorine molecule to form chlorine atoms in gaseous state. The energy of dissociation of bond energy is +122 kJ/mol. Third step involved ionisation of sodium in gaseous state to get positively charged sodium ion by losing an electron. The ionisation energy for this step is +494 kJ/mol. The fourth step is the addition of electron to the chlorine atom to get negatively charged chloride ion in gaseous state. The electron released for this process is the electron affinity and for this it is -349 kJ/mol. Fifth and the last step is the formation of sodium chloride from it gaseous ions. The lattice energy released in this process should be negative and need to be calculated. The heat of formation for the whole reaction if it occurs in one step is -411 kJ/mol. So, the lattice energy of sodium chloride is -785 kJ/mol. Similarly lattice energy of any ionic compound can be calculated.